Truly one of the most unusual and exquisite KP pieces I've ever had. Yes, their deco is 2DIE4, but this little Edwardian treasure is so unusual. C.1910 this is a miniature work of art in the form of a tiny little flower basket. The pierced wire basket is bordered on the top and bottom with tiny little bezel set white pastes sprouting glorious little sapphire and clear paste forget me nots and roses in bezel settings. It's 1 1/4" x 3/4". 'C' Clasp. Extraordinary condition. Marked 935 KP with an unknown jeweler mark. 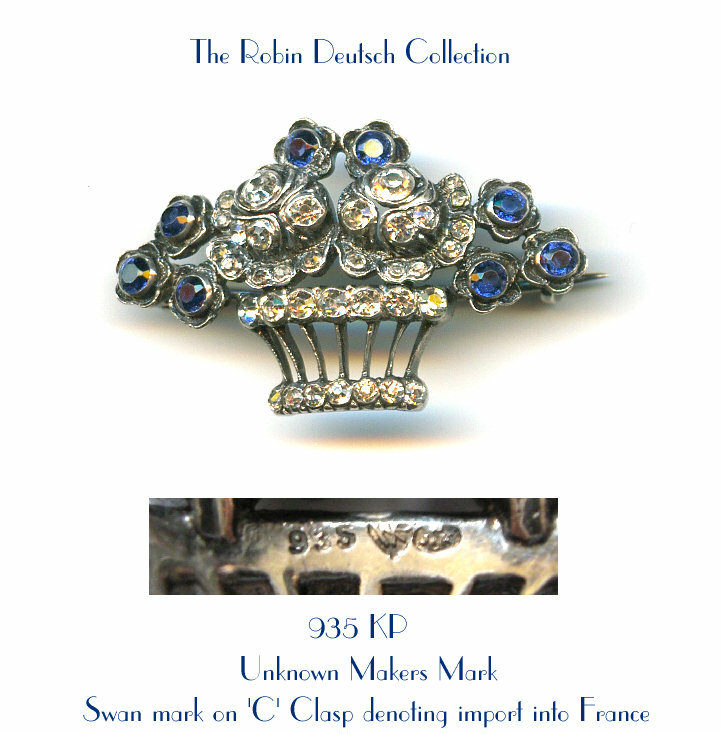 The tiny little 'C' clasp has the mark of the swan which is an import mark for France. C'est Magnifique!